"The treacherous and capricious qualities of steel increase with its tensile strength"
It is not uncommon to have decorative engine hardware cadmium plated and "oven-baked" during overhaul. Extreme caution is advised. A particular hazard of cadmium-plating high strength steels is the absorption of hydrogen into the base metal. This hazard is countered by baking the parts after plating. The baking process is critical. Shown above is a hydrogen embrittled nut failure on an aircraft engine. Even though controls were in place, the nuts still failed. Not only is oven temperature and time important, but also the distribution of heat throughout the batch of parts. Oven bake shall occur within four hours of plating and for types II and shall be done before application of supplementary coatings. Since high-strength steel parts are subject to hydrogen-embrittlement during any plating process they should not be plated unless proper engineering and quality controls have been established and approved. Per T.O.1-1A-9, "All steel parts having a hardness of Rockwell C40 (180,000 PSI) and higher shall be baked at 375 +-25 degrees F. for three hours minimum. SAE-J1648 states: "It may be necessary to provide coatings other than electroplating for fasteners with hardness above 40 HRC"
All steel parts having an ultimate tensile strength of 220,000 PSI or above shall not be plated, unless otherwise specified. When permission is granted, a low embrittlement cadmium plating bath shall be used. Federal-Specifications-QQ-P-416 should be used for cadmium plate requirements. Critical parts should be magnafluxed after plating." Years ago, the standard was to oven bake for four hours. This was found to be insufficient and the standard changed (2006, but adopted in the 1980's) is that "cadmium-plated parts must be baked at 375 degrees F. for 23 hours, within two hours after plating, to prevent hydrogen embrittlement." As Cadmium plating is being phased out due to environmental concerns, zinc is often specified as an alternative coating. However, as Lycoming found out, substituting Cadmium for Zinc can lead to disaster. Zinc plating can also lead to hydrogen-assisted cracking. A change from a Cadmium plated crankshaft gear bolt part number STD-2209 to a Zinc-plated-bolt resulted in several aircraft accidents, at least one with multiple fatalities (NTSB IAD02FA091). Several Airworthiness-Directives were issued to remove the Zinc plated bolts and replace them with Cadmium plated ones (AD2002-23-06, AD2002-20-51). Hydrogen embrittlement and hydrogen-assisted cracking remains difficult to control and predict. There is increasing use of mechanical applied zinc coatings that eliminate the plating process and the resultant hydrogen problem during manufacturer. For further information see the following SAE publication: SAE AMS 2759/9B "Hydrogen-Embrittlement-Relief (Baking) of Steel Parts"
An interesting example of hydrogen embrittlement is the fatal accident of a Bell-206 helicopter in British-Columbia in June of 2000. The screws in the fuel control unit broke due to hydrogen embrittlement. The repair facility replaced the screws during overhaul with standard AN503 screws. Ordinarily hydrogen embrittlement is not a problem with these screws because the rated tensile strength is 125,000 psi, (862 MPa) well under the 145,000 psi where hydrogen embrittlement becomes a problem. However, the screws tested much stronger than they should have been due to improper heat treatment. The cadmium plating applied to the screws then introduced hydrogen into the steel. If the screws had been manufactured to the proper tensile stress, they would not have failed and the fatal accident would not have occurred. This accident was caused by screws that were stronger than they should have been. In fact, the entire lot of screws were non-conforming. 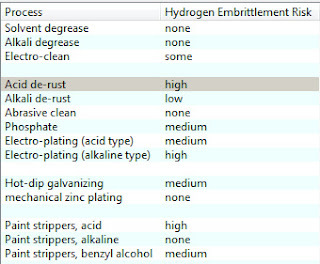 Another interesting example of hydrogen embrittlement failure is when Lycoming changed their crankshaft-gear retaining bolt STD-2209 to zinc-plating from cadmium-plating. This one bolt in the engine is a "Jesus" bolt, in that if it breaks, the engine quits. Unknown to Lycoming at the time, zinc plated bolts with a hardness exceeding RC 39 have a history of hydrogen embrittlement failure. Soon afterward random bolt failures started to occur - a typical trade-mark of hydrogen embrittlement failure. Lycoming didn't heed the basic rule of aircraft design: "no single failure shall have a catastrophic effect." See Lycoming-Service-Bulletin-No.-554. "After over two years service in the "snow belt", class 12.8 bolts in GM "A" car rear suspensions began to fail, leading to the recall of 6.4 millions cars. Analysis of the failures showed that the cause was corrosion induced hydrogen assisted cracking." Beech tried using high-strength-H-11 bolts in their aircraft with catastrophic results (NTSB-Safety-Recomendation-A-82-32 and -33) because of bolt failure due to stress corrosion failure. Bolts made from this alloy are popular for automotive performance engines. Even being described in one ad as "Extreme Duty"! FAA Advisory-Circular-AC20-127 calls for the replacement of SAE H11 bolts in primary structure on all aircraft. "The service history of H11 bolts used in primary structure indicates a higher than normal failure rate. 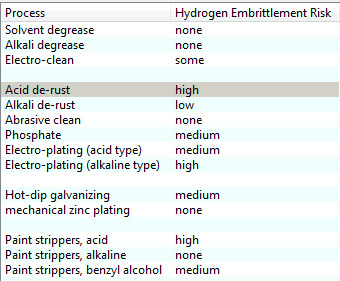 These failures are attributed to stress corrosion-cracking and may become a safety problem. The use of H11 bolts in primary structure is therefore discouraged and should not be considered for use on new type design aircraft." Primary structure is defined as that structure that contributes significantly to the carrying of flight, ground, or pressurization loads, and whose integrity is essential in maintaining the overall structural integrity of the airplane. As a mechanic, inspect and replace any high-strength bolts showing corrosion. Not only do these high-strength bolts suffer from low energy of fracture (brittle), but the act of corrosion itself may cause cathodic hydrogen absorption arising. "The worst sin in an engineering material is not lack of strength or lack of stiffness,..., but lack of toughness, that is to say, lack of resistance to the propagation of cracks"
*1. Some sources give 130 ksi or greater as the start of hydrogen embrittlement concern. One such source is the Navy SUBMARINE-FASTENING-CRITERIA (NON-NUCLEAR) TECHNICAL MANUAL S9505-AM-GYD-010 paragraph 3-20 "Preloading"
*2. Navy SUBMARINE FASTENING CRITERIA (NON-NUCLEAR) TECHNICAL MANUAL S9505-AM-GYD-010 paragraph 3-20 "Preloading"